Robert de Castella, our Patron, sent a message to John Dean in 2005 when John was still President of the Melbourne Marathon Spartans. Although the message is now several years old it is still as fresh and pertinent as it was then. 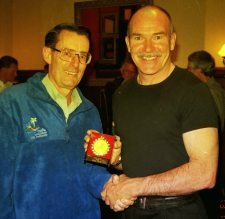 Past President John Dean receiving his 25-Year medal from Deeks in 2005. You are all a very special group of individuals and are a constant inspiration to those of us that love the marathon. To me life is not about taking the easy path. Life is about moving yourself outside of your comfort zone. Today too many people, kids and adults alike, don’t want to push themselves. This is sad because it is only when we are under pressure and when we are forced to extend ourselves to our limit that we realise how wonderful and amazing we are, and realise what we can really achieve. You are individuals that have chosen to extend yourselves beyond your comfort zones, and by doing this you experience what many other don’t even know exists. It makes your lives richer and should make each and every one of you proud. To me this is what it means to be a Spartan. To actively pursue a life where you extend yourself and are not satisfied with being just ‘one of the pack’. This obviously goes beyond just running the marathon, and extends into how we live our lives. Congratulations and my very best wishes to all of you that are running this year. Robert de Castella in full flight. 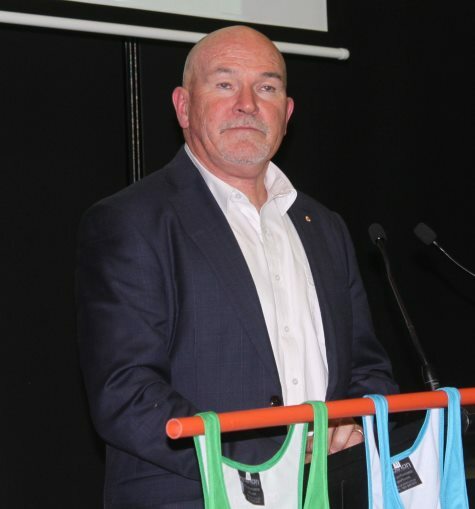 Robert de Castella spoke at the Annual General Meeting of the Melbourne Marathon Spartans prior to the 40th running of the Melbourne Marathon. 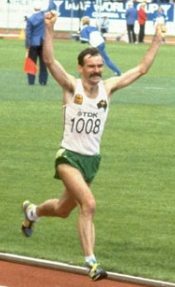 Robert now devotes much of his time to the Indigenous Marathon Foundation. He also spoke in 2007 before the 30th marathon. Robert gave an in-depth interview in 2014 to an ABC program. Thanks to Bruce Hargreaves for the link. See this youtube video for two minutes of highlights of Rob’s career.